Sometimes I like to stop and take stock of just how far Supergirl has come in the past three seasons. Like all of the CW superhero shows, it’s easy to write off the series as being a little old fashioned or clunky in its episodic approach to superhero storytelling. But what I don’t think the show gets enough credit for is its willingness to expand its world. For instance, in last season’s “Supergirl Lives,” the show introduced the idea that its major players might occasionally travel off world sometimes. Tonight, Kara and J’onn fly a shape-shifting 1950s Chevy Bel Air Convertible to Mars like it’s the most casual thing in the world. “Far From The Tree” is a particularly ambitious episode, one that tries to introduce not only the dynamics of a White Martian political rebellion but also the details of an entire Green Martian religion, plus an emotional father/son reunion on Mars and a heartbreaking father/daughter one back on Earth. Ultimately, the episode bites off a little more than it can chew, leaving several of its plots and characters feeling more like outlines than full-fledged storytelling elements. But ambition counts for a lot in my book, and it’s exciting to see Supergirl strive for this kind of big, emotional, philosophical storytelling, even when it doesn’t execute it flawlessly. It turns out the reason M’gann called J’onn to Mars at the end of last week’s episode wasn’t just to help her White Martian resistance take one more step towards victory with the help of a magic psychic staff. 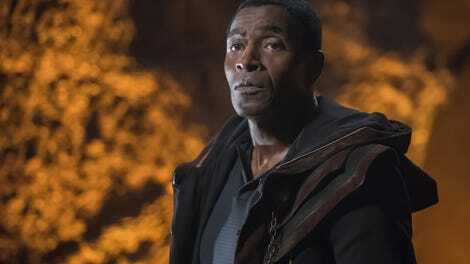 It was also to reunite him with his long presumed dead father, M’yrnn J’onzz (Carl Lumbly). That’s right, everyone’s favorite Space Dad also has a Space Dad. And as ever, Supergirl isn’t afraid to dive into the darkness of J’onn’s backstory. M’yrnn spent centuries being tortured at the hands of evil White Martians to the point where he refuses to believe J’onn is anything but a new trick designed to torment him. And though J’onn’s overjoyed to see his dad again, their reunion also brings back painful memories. J’onn immediately asks whether his daughters and wife might have survived too and David Harewood delivers the question with a palpable sense of desperation that immediately puts us in J’onn’s disoriented state of mind. After largely underserving him in season two, it’s nice to see both Supergirl and Supergirl put J’onn front and center again. Kara’s immediately willing to drop everything and join J’onn on his Martian journey and the only thing stopping Alex from doing the same is her inability to survive on Mars. So Kara gets to serve as J’onn’s support system for once and though her superstrength comes in handy during a fight with some evil White Martians, it’s ultimately her empathy that proves most helpful: She’s able to bridge a gap between M’yrnn and J’onn and help the elder Mr. J’onzz open his heart to the possibility that his son might actually still be alive. That leads to the episode’s most heartwrenching scene in which J’onn and M’yrnn revisit a happy memory of J’onn’s children and finally share a long overdue emotional reunion. There’s a lot going on in the Martian half of this episode. Too much, perhaps. But Harewood and Lumbly deliver emotionally rich performances that ground the fantastical world building in something relatable. They’re an immediately believable father/son duo and the idea that M’yrnn will be sticking around for a while is a welcome one. Supergirl tends to be strongest when it’s dealing with themes of family, and given that both father and son have long thought of themselves as “the last Green Martian,” seeing how they navigate their new, less isolated reality has the potential to be really compelling. Back on Earth, “Far From The Tree” digs into another fraught father/child relationship—the estranged one between Maggie and her father, which comes to a head at Maggie and Alex’s bridal shower. What I like about this storyline is that it doesn’t offer any easy answers. It lets Oscar be unequivocally wrong in his rejection of Maggie (“The only thing shameful about that story is how your father treated you,” Eliza rightly assures her), but it doesn’t take the easy route of writing him as a one-dimensional villain. Though he kicked his daughter out of the house when she was just 14, Oscar still carries around a photo of Maggie in his wallet and keeps up with her career from afar. There’s a palpable sense of love and longing not only from Maggie but from Oscar as well, and you get the sense that in his mind all Maggie needs to do is reject her sexual orientation and he’d be more than happy to welcome her back into the family. It’s a twisted point of view, but it’s one rooted in his own lived experience: After devoting his life to overcoming racial discrimination with respectability politics, Oscar can’t see Maggie’s sexuality as anything but a social burden she’s putting on herself—one he wants no part in enabling, especially in a world still so rife with racism (both “the wall” and Donald Trump’s quote about Mexicans being rapists and murders get referenced). But ironically, Oscar can’t see that in trying to protect his daughter from bigotry, he’s actually inflicting bigotry onto her. Carlos Bernard’s lived-in performance helps sells the idea that Oscar could justify such a warped worldview. And though Maggie finally gets closure in the sense of making a formal break from her bigoted family, Supergirl doesn’t sugarcoat the painful reality that still exists for so many LGBTQ people. But as is so often the case, the Maggie storyline works a little better on paper than it does in practice thanks to Supergirl’s penchant for on-the-nose monologuing. The ideas behind the Maggie/Oscar tension feel realistic, but the way they so openly discuss them doesn’t seem particularly reflective of the way real-life family rifts fester. Subtext has never been Supergirl’s forte, but a little could’ve gone a long way here. The bigger problem is that the episode just doesn’t have enough time to let any of its elements breathe. Though I can see why “Far From The Tree” decided to pair the J’onn/ M’yrnn and Maggie/Oscar storylines together because they both center on fathers who refuse to see their children for who they are (although in M’yrnn’s case, that’s a far more temporary and circumstantial issue), in the end both stories wind up feeling a little shortchanged. The Martian world building, in particular, flies by so fast and with so many Martian names thrown around that it’s easy to miss the details on first viewing. M’gann hardly gets any screen time; the White Martian who grows from hotheaded to trusting is little more than a character sketch; and the introduction of M’yrnn’s faith is yet another element that barely has any time to land. On the other hand, if I had to choose between an ambitious but overstuffed episode and one that plays it safe, I’d take the former any day of the week. In addition to starring in Cagney & Lacey and Alias, Carly Lumbly also voiced Martian Manhunter in a bunch of DC animated properties and video games. He thus fits quite nicely into the Berlantiverse trend of casting former superhero actors to play superhero parents. 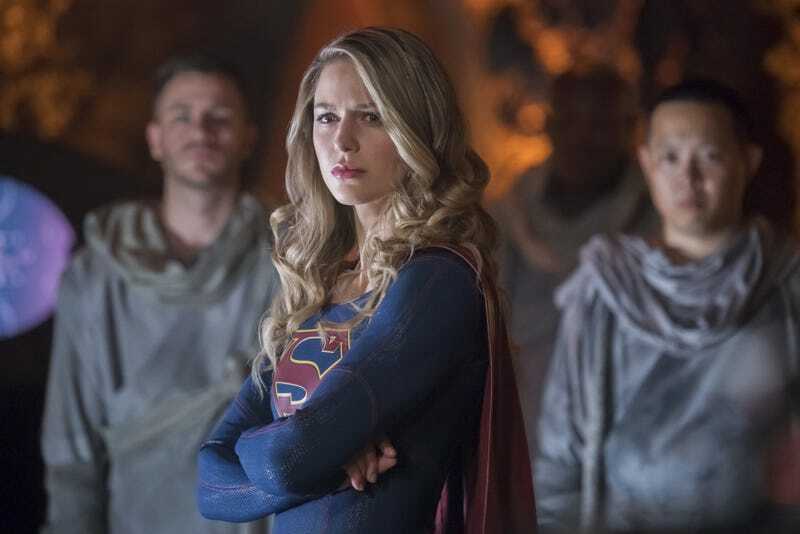 I believe this is our first look at the new season three intro, which explicitly frames Kara as a refugee. This week’s Melissa Benoist line delivery that made me instantly burst into tears: “They’re beautiful, J’onn” upon seeing the projected memory of his two daughters. Though the show makes a stab at justifying it, there’s really very little reason that this episode’s various White and Green Martians spend so much time in human form. But given that the episode goes all out on its CGI elsewhere, that’s the sort of production reality I’m willing to forgive. A complicating factor when it comes to representation: Though this episode explicitly centers on Maggie’s Mexican heritage, Florina Lima doesn’t have any Latina heritage herself.